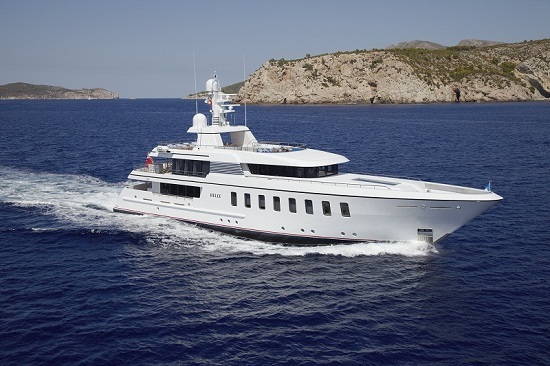 Feadship is taking a brand-new superyacht to Asia for the first time this spring. A dedicated tour by the 45-metre Helix will take in Hong Kong in March and the Hainan Rendezvous in early April before heading off to the Singapore boat show at the end of the month. Feadship has an unrivalled pedigree in the superyacht market and a history that goes back to 1849. Although the Dutch experts were building large yachts for Middle Eastern and European royalty in the 1930s, many maritime historians point to the 1951 New York Boat Show as the defining moment in the Feadship success story. This was the first time that Feadship had displayed its yachts to the American public, which expressed immediate admiration for the quality and craftsmanship. More than half of the 250 Feadships launched have since been created for sophisticated owners in the United States. And now, with the arrival of Helix in China, Feadship is set to embark on a new phase in superyacht history. Helix will be on tour in Asia from 18 March through 29 April: The yacht will be staying at the Gold Coast Marina in Hong Kong from March 18 to 31. She will then head for the third Hainan Rendezvous, which is being held at the Visun Royal Yacht Club from April 5 to 8. The yacht will also attend the Singapore yacht show from April 27 to 29. Helix will showcase to the public how Feadship is able to combine a timeless design and fine detailing with a classic bow to ensure the most comfortable of seagoing performances. Invited guests and potential clients will also be given a personal tour of an interior that synthesises light-fabric-covered walls in mahogany wooden frames with contrasting materials and tasteful furniture. With four suites and a master stateroom on the main deck, all guests enjoy phenomenal views from their cabins. Helix also has a wealth of outdoor entertainment and dining options, reflecting a beach house on the water philosophy.